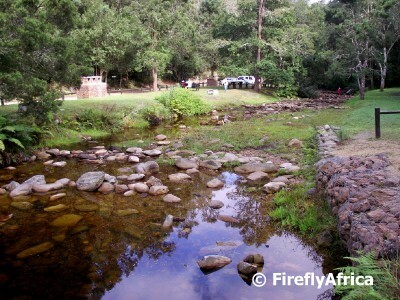 Most people visiting the Knysna forest normally head towards the Millwood goldfields northwest of Knysna. Just after the Daleen Matthee Memorial the road passes what is arguably the most breathtaking picnic spot in the forest, Jubilee Creek. 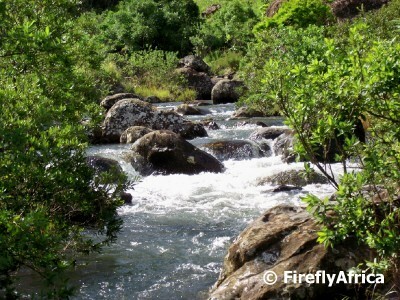 It is situated next to a beautiful stream and surrounded by indigenous forests with shaded grassy areas to relax on. Gold was discovered in this part of the forest in the 1880's which sparked a gold rush into the area from not just South African diggers, but also from Australia, Britain and California. Jubilee Creek was named in honour of Britain's Queen Victoria who had her Golden Jubilee in 1887, the same year the gold fields were officially opened. Upstream and downstream from the picnic site there was a lot of digging going on for gold and the 3,6km Jubilee Creek Mining Walk will take you through the forest to some of the remains of these digs. 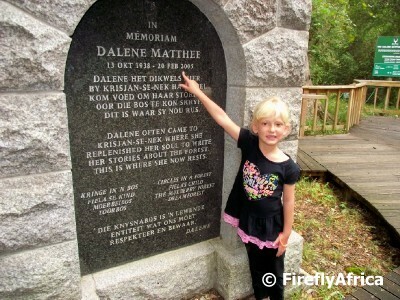 One of my favorite writers is the late Daleen Matthee and it is because of the 4 books she has based in the Knysna forest that I have such a fascinating interest in the forests of the Southern Cape. 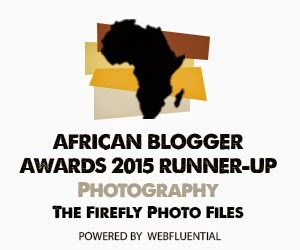 All four of these books (Circles in the Forest, Fiela's Child, The Mulberry Forest and Dream Forest) takes place in the late 19th and early 20th century in and around the Knysna forest and have the old woodcutters as the central characters. 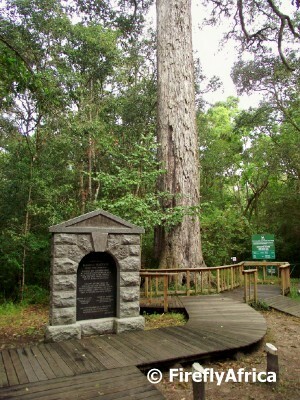 The memorial stands next to a 800 year old Outeniqua Yellowwood Tree which is now referred to as the Daleen Matthee Big Tree while the hiking trail starting at Krisjan-se-Nek has been renamed Circles in the Forest Trail after her best known book. 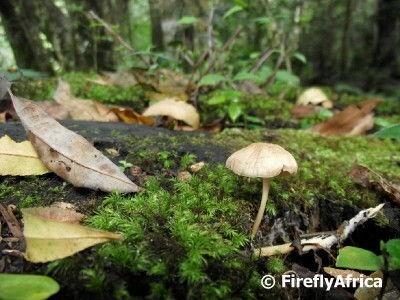 This scene presented itself to me while exploring the Knysna forests and I just had to take a photo of it. Looking it it and then closing my eyes I can imagine being in the forest. The shades of green and brown all around, the moist forest smell, the cool forest air on my face, the cracking of leaves underfoot while walking down a path... Need I say more? 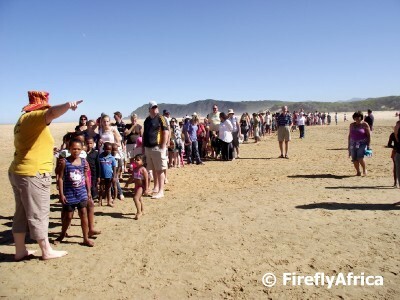 One of the events that was held during the recent Sedgefield Slow Festival was an Easter Egg drop on the beach next to the Swartvlei lagoon. 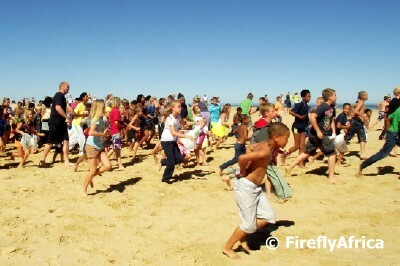 The crowd that turned up exceeded the wildest expectations of the organisers, so the kids were split up into three groups according to age and size. After the splitting of the kids (nearly as hard as the splitting of an atom) were finally done, the wait started. 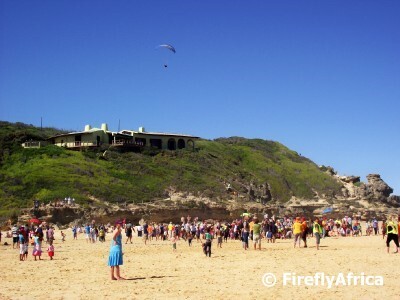 Everybody was scanning the horizon as the Easter Bunny (who seemed to have forgotten his suit) was making his Easter egg drop from a paraglider. He came by three times to make drops for each group and with each pass the chaos just increased as with anything that involves throngs and throngs of kids. 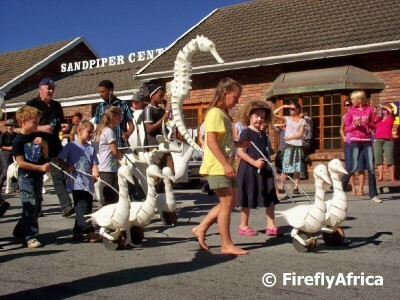 The town of Sedgefield on the Garden Route was confirmed as Africa’s first Cittaslow Town by the International Cittaslow movement at the end of 2010. Inspired by the concept of ‘slow food’, Cittaslow is a worldwide membership organisation promoting quality of life and resisting fast-lane lifestyle. 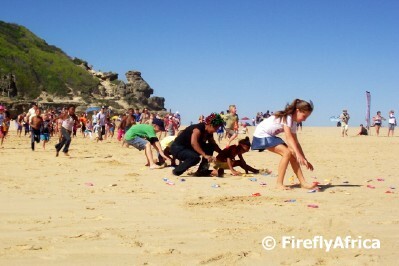 As part of their continued celebration of being a Slow Town, Sedgefield had their Slow Festival over Easter weekend. 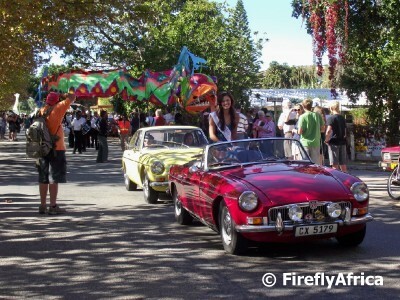 One of the highlights of the festival was the parade through town which was led by the newly crowned Miss Slow Festival on the back of the red vintage car. 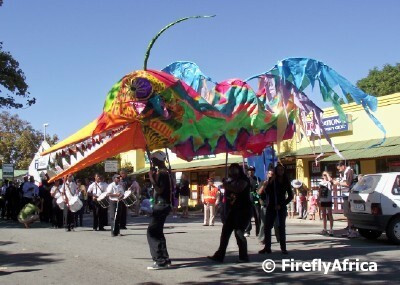 Behind the vintage cars came Sedgefield's own Chinese style dragon / bird / something else. The team of the Smutsville performers operating it was awesome bobbing and weaving at the tune of the music and "scaring" little kids and dogs. 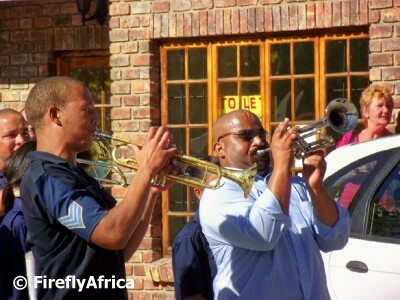 The music was provided by the brilliant local church marching band from St. James and the two guys on the trumpets didn't hold back one little bit. Following them was the most popular part of the parade. 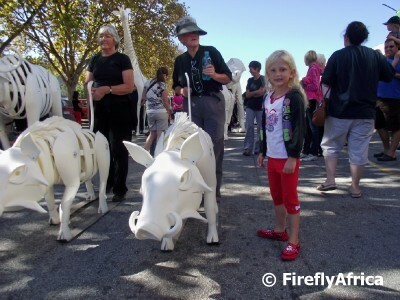 Life sized animal puppets by Roger Titley who also created the ‘Elephant puppets’ that did the closing ceremony for the 2010 Soccer World Cup. 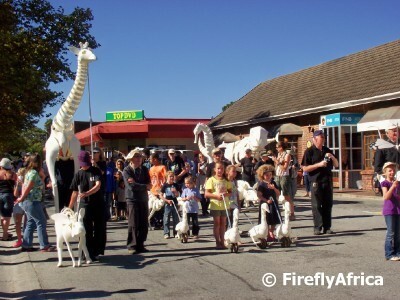 The animals included everything from geese to a sea horse and just about every four legged wild animal you can imagine. 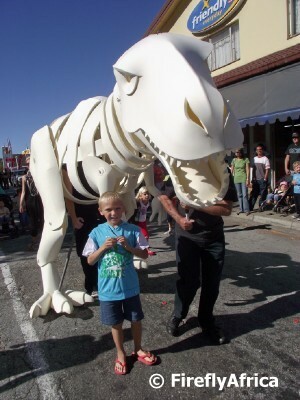 ... while Chaos Boy is getting a bit closer acquainted with the T Rex. 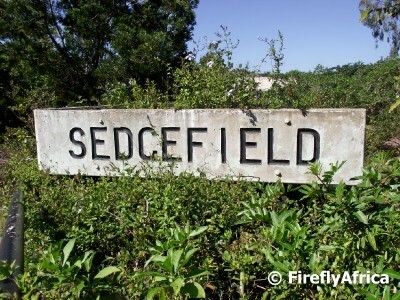 The Sedgefield Station was a popular spot with tourists while the Outeniqua Choo Tjoe was still running past there twice a day, but since the tracks were damaged in the floods of 2006, traffic to the station has slowed down... drastically. This wasn't good news for Joe and Louisa who own the Steam Whistle Stop coffee shop in the old station building and saw a great part of their business turnover leave with the last train. 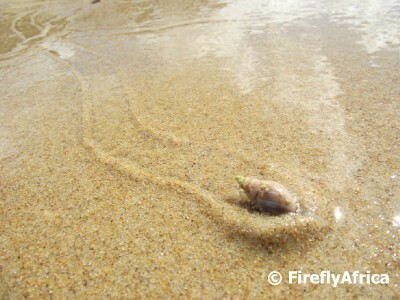 But they didn't give up and kept pushing on. They still greeted everybody that came in with a hearty smile and knew most of their regulars on a first name basis. 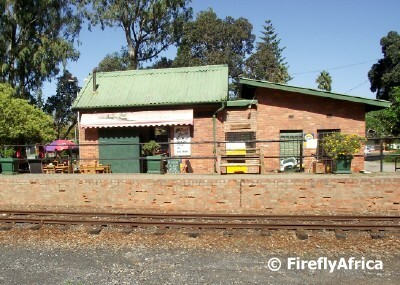 They still kept on producing the most scrumptious breakfasts and the best pies on the Garden Route. They persevered. We headed out to Sedgefield for breakfast while where were in Knysna and enjoyed their warm hospitality right next to the cosy fireplace. 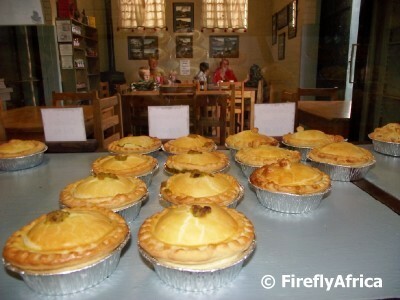 Although we had breakfast, I ventured behind the counter for a closer look at Joe's pies that make people do special trips to Sedgefield. Yummy. By the way, their Apple Crumble "pie" is the best I have every had. 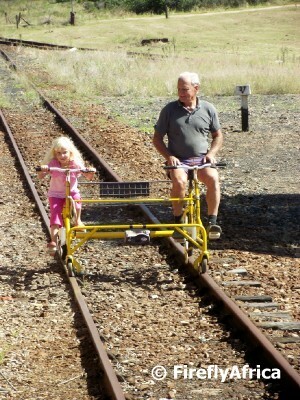 The previous week there was a feature about Sedgefield on the Afrikaans lifestyle magazine show Pasella (see Knysna Tourism article) and during the insert they showed a bicycle made by a local gentleman that he rides with on the train tracks. As luck would have it he was taking a rest at the station when we were there and we all had a chance to try out the bike. 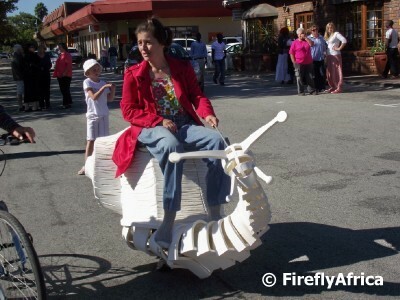 Here Drama Princess is taking a turn after initially not wanting to go when we had a ride. 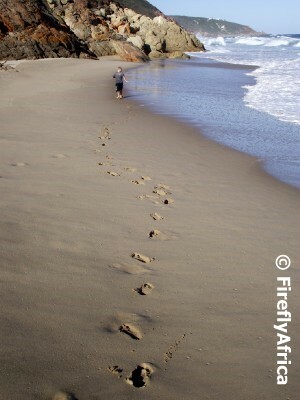 Sea urchins are normally found in rock pools and when alive have sharp spikes all over... so watch out not to step in one cause it may lead to jumping around on one leg holding on to a painful foot. 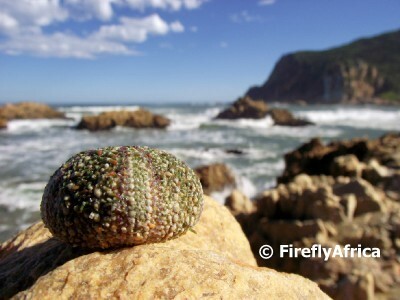 I found this urchin that has already lost it's spikes in a pool near the Knysna Heads and perched it on a rock for a picture with one of the Heads in the background. 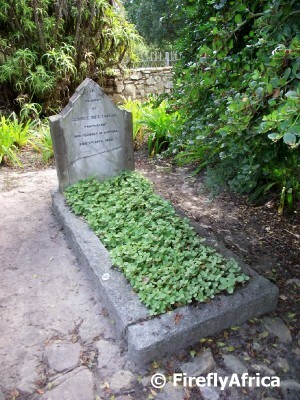 I recently paid my respects at the grave of George Rex in Knysna, I thought I'll share his story with all of you. 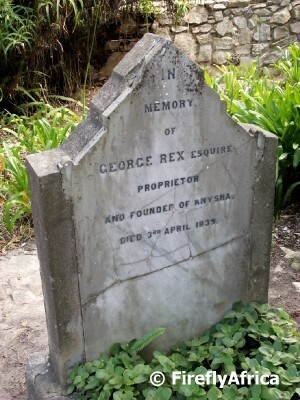 George Rex (29 August 1765 - 3 April 1839) is generally known as the founder of the town of Knysna. 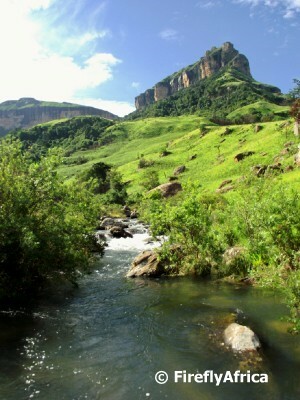 He came to the Cape Colony from Britian in 1797 and held various high ranking positions in Cape Town before settling on the farm Melkhoutkraal, in the Knysna district. Here he was mainly a timber exporter and trader, but he played a huge roll in the development of the town and surrounding area. Rex never married, but had but he had four children by a former slave, Johanna Rosina van der Caap, and then nine more children by one of her daughters (Carolina Margaretha Ungerer) by a previous master. For the last two centuries people have been intrigued by the legend of George Rex and the story that he may have been the illegitimate son of George III, Prince of Wales at the time, and a Quaker girl, Hannah Lightfoot. The story goes that he was sent to the Cape Colony to avoid a royal embarrassment back in Britain and that was also why he never married as any legitimate descendants would have had a claim on the throne. Although there are apparent proof to the contrary, the legend still lives on. It may just be that the true king of England live in this beautiful town as, if the legend is true, George Rex should have been king instead of George IV after George III died in 1820. About a month or so ago I stated in a post on the Mossel Bay War Memorial that each and every town seems to have a war memorial of some kind. 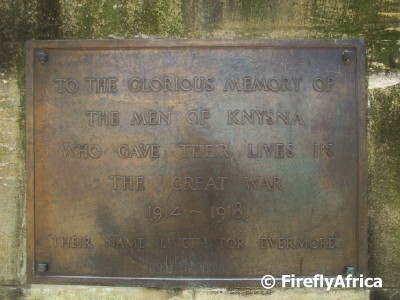 We spent a couple of day in the beautiful town of Knysna and I made sure that I stopped by the Knysna War Memorial during our visit to get a couple of photos to keep on proving my point. A subscription list was opened in 1921 by Herold Thesen to collect money towards the erection of a memorial to remember those who died in the service of their country. The Memorial was unveiled in 1922 by Reverend Captain Alfred Duthie who was Chaplain to the Forces in Flanders and France during the First World War. 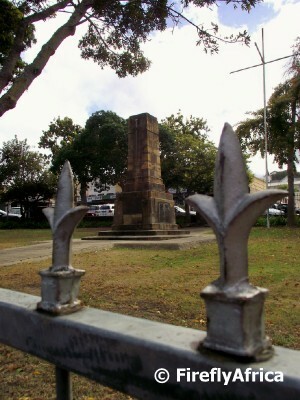 The memorial stands on Memorial Square in the centre of town right nest to the Main Street. 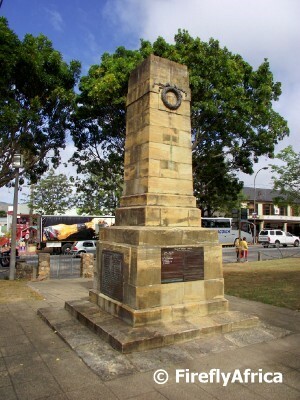 The Memorial not only contains the names of men from the town that had fallen during the Great War, but also plaques with the names of those who died during World War II and the Bush War. 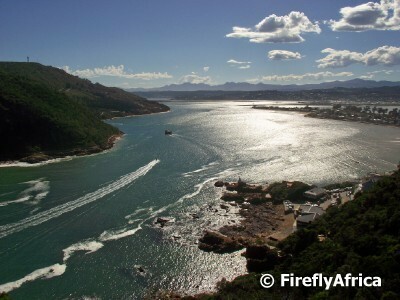 If stunning views across South Africa had to take part in a beauty pageant, the view from the Eastern Head in Knysna would be the beautiful blond with the long legs that makes it into the top five and at the least walks away with one of the crowns and sash. 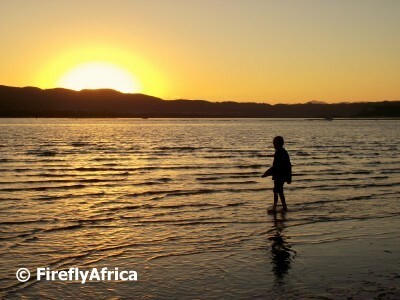 I was busy taking sunset pictures across the Knysna lagoon, but was struggling to find something interesting to place in the foreground when Chaos Boy came wading along. Aha, just what I was looking for. I had to keep on running ahead of him to get him in the right position, but by now my kids know not to turn and run when they get requested to "model" in my pics. 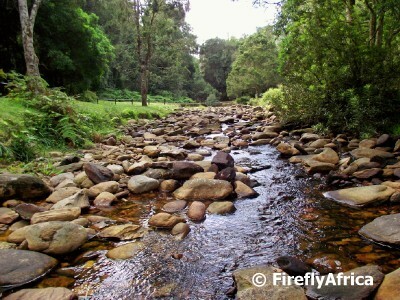 Up to about 100 to 150 years ago the indigenous forests along the Southern Cape stretched all along the area known as the Garden Route. When the authorities of the time realised that due to extensive logging the forests wouldn't last forever, it was decided to replace some of the decimated areas with mostly pine, but also blue gum, plantations and to cut back on the wood cutting operations in the forest itself. 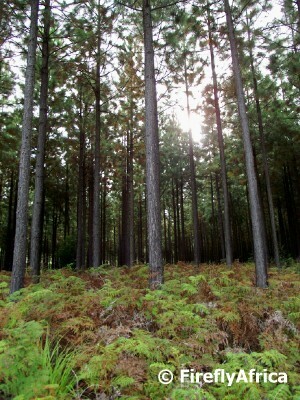 Today forestry and logging are still one of the biggest industries in the Southern Cape with the plantations producing the wood and the indigenous forest being protected. 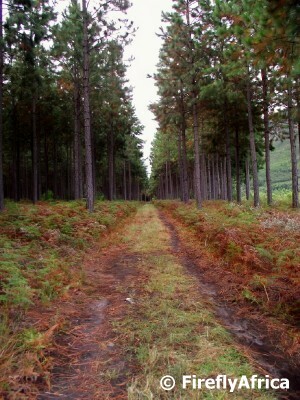 On a recent trip to the Tsitsikamma I stayed at Tsitsikamma Lodge and had the opportunity to walk through a pine plantation on one of their short trails. 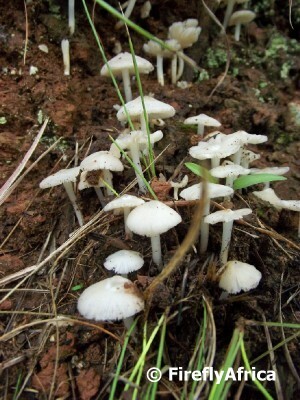 I found this collection of tiny little mushrooms in the Drakensberg early in the year. 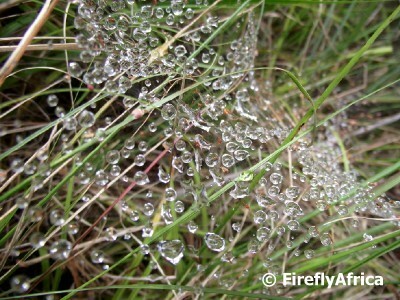 I haven't been able to find anything on them in my nature books though. You can see in the second photo it looks like some of them have "opened up" as can be seen from the broken edges. 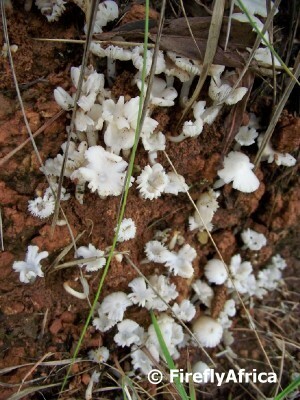 Actually makes them look like mushroom flowers. I photographed this juvenile Knysna Loerie (Tauraco corythaix) at Birds of Eden outside Plettenberg Bay on the Garden Route. The difference between the juveniles and adult birds is that the adults have white tips along the top of their crests and more white below the eyes. 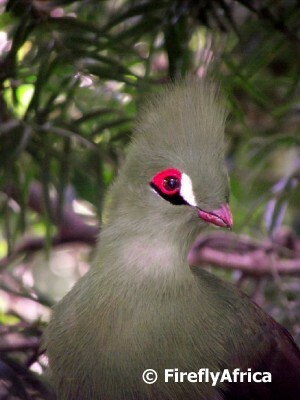 The loeries blend in very well in their forest environment using their camouflaging green feathers. Normally they hop from branch to branch, but as soon as they open their wings to fly or glide to the next tree that is when you see them. Their wings are a bright scarlet red underneath which, if you keep your eyes peeled in the forest, is one of the only times that you will spot the bird. The Loeries, with their distinctive "ko-ko-ko-ko-ko" sound is by far my favorite bird and always a pleasure to see, or even just hear. 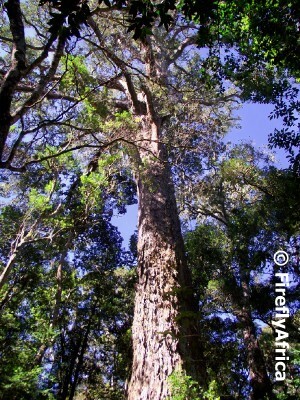 The magnificent indigenous forests along the Garden Route once stretched all the way from Humansdorp to Mossel Bay, but extensive logging operations in the 1800's and early 1900's meant that huge tracts of it have disappeared. 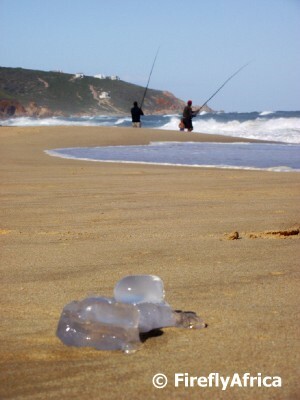 Today the remains of the forest are all protected areas, most of them falling within the management areas of the Garden Route National Park. 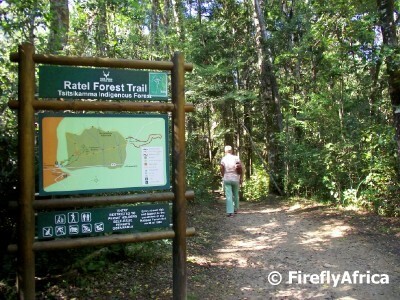 The biggest sections of the forest can be found in the Tsitsikamma and Knysna areas where the public can access parts of it through hiking trails and the odd forest road. 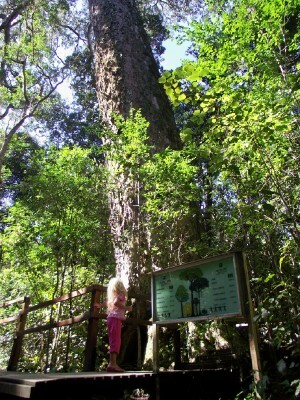 One of the most popular stops along the Garden Route where visitors can get into the forest is at The Big Tree in the Tsitsikamma. 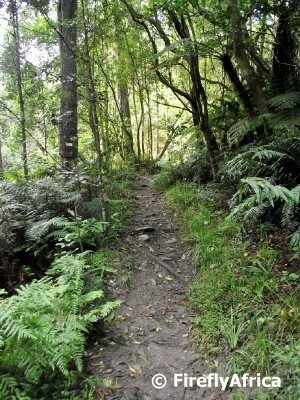 A boarded trail takes one about 500 meters into the forest. 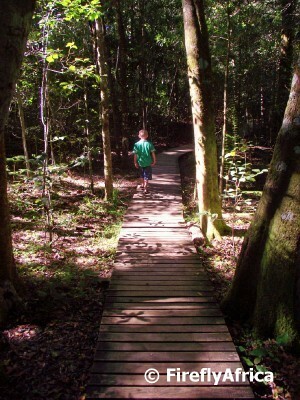 The shaded walk is comfortable and easy and all along the way information boards point out interesting trees and ferns. The walk ends in a clearing before you approach the majestic Big Tree. 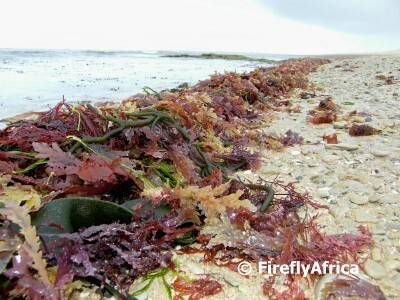 The Big Tree is a 800 year old Outeniqua Yellowwood (South Africa's national tree), which means that it was 300 years old already when Portuguese explorer Bartholomeu Dias came along our coastline in 1488. Trees like this one was widely targeted when the woodcutters were working in the forests a century or so ago, which means that there aren't that many of them around anymore and of those only a few are accessable like this one. With Drama Princess standing at its base looking up one only realises how big the tree really is. It's 36,6 meters tall with a trunk length 18 meters and trunk circumference of 9 meters. This means that it will take 7 or 8 adults holding hands to reach around the girth. 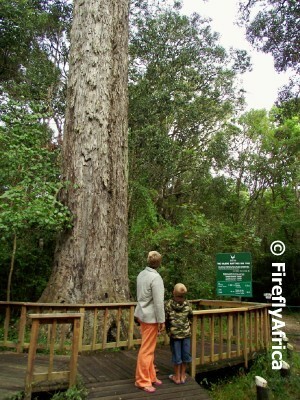 So next time you venture down the Garden Route again, look out for the Big Tree turnoff close to the Storms River Bridge. 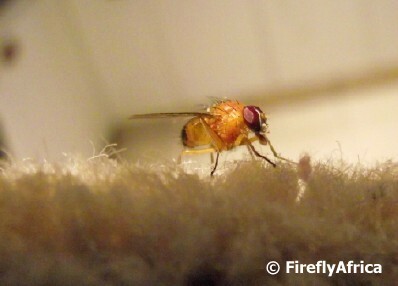 I can never figure out why a fly is called a fly and not a sit and why Noah never swatted that darn fly... 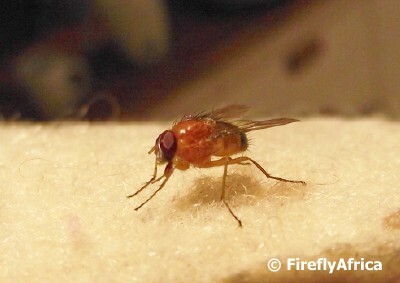 This fly falls in the "why is it not called a sit?" category as I just couldn't get rid of him. 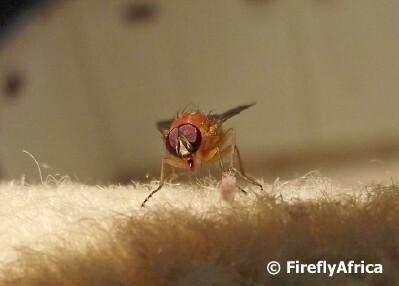 So eventually I decided to grab the camera for a couple of pictures, seeing that he was so keen to pose, before sending him off to the fly life hereafter.